Type out these three questions. Use the link below to answer the questions. Print out. Turn in at beginning of class on Tuesday, August 26, 2014. 2. What are the characteristics of prose? 3. What are the types of prose? Be on time for class. Homework is accepted only during the first few minutes of class. READ IN CLASS - "from Of Plymouth Plantation" pp. 3-8. --Active Reading Strategies - Summarizing. Students will create a tri-fold for note-taking. --They will read and summarize the first two sentences of the first paragraph. --They will reread the paragraph for clearer understanding. Read pages 5 - 8. Continue using strategy where needed. ---Book Check Outs - Students will check out text books. Books must be brought to class daily. their parent(s) sign the "Opt Out" form. The form is due by Wednesday, August 27, 2014. No student will do both Grammar Assignments. According to your test results, each student will do either Capitalization or End Marks. NOT BOTH!!! Use the Quia website for these assignments. Simply click on the link below. Log in with the username and password handed out in class. The secret word is lovely. Please complete the following worksheets and quizzes by August 28, 2014. 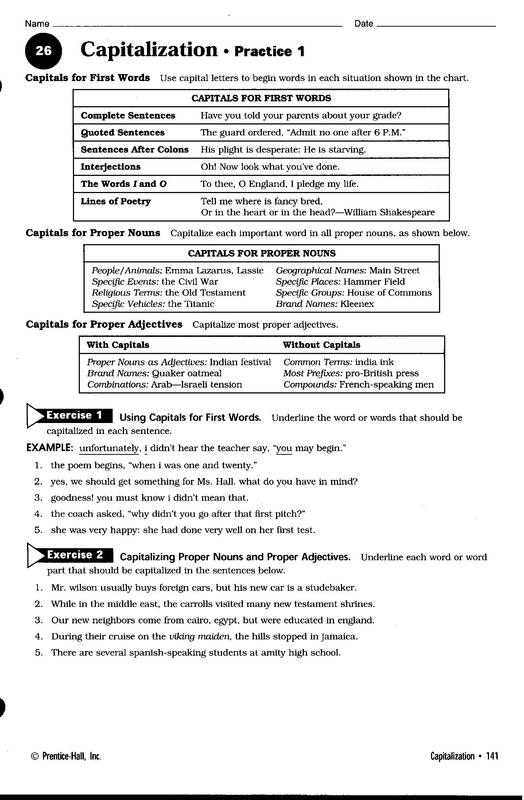 Click here for Capitalization Video lesson. Click here for End Marks Video (Punctuation) lesson. ALL STUDENTS WILL DO THIS! COLLECTIONS - Online Textbook Homework - Read pages 9 - 14. A. Students logged onto the "BEEP" Portal to access online textbooks. B. Students received their usernames and passwords for my.hrw.com. electronic sticky notes and online highlighters. Use the Quia website for these assignments. Simply click on the link. Please complete the following assignment and quiz by August 28, 2014. I. Complete Writing Profile ASSIGNMENT sheets. II. Use computers to access Teacher Web Page. III. Work on tonight's homework. IV. Questions & Answers - Accessing Online Assignments. Students will divide into groups. They will read and Discuss pp 9 - 16 - "from Of Plymouth Plantation"
1) How did Bradford describe the natives? 2) Why do you think he referred to them in that manner? 3) Describe the relationship between the natives and the Pilgrims. 4) What is your opinion of the natives? the Pilgrims? Quiz Wednesday on "of Plymouth Plantation". Notes will be posted on Edmodo. Each Group will analyze a section of "from Of Plymouth Plantation." Present in class on Wednesday.